How to make food colours at home: Food colours have been around for longer than we might think. It actually dates back to 1500 BC. We encounter food colours in many of the foods and beverages every day. These food dyes make our food looking and tasting tempting and good. There are two main categories – natural and synthetic food colourings. 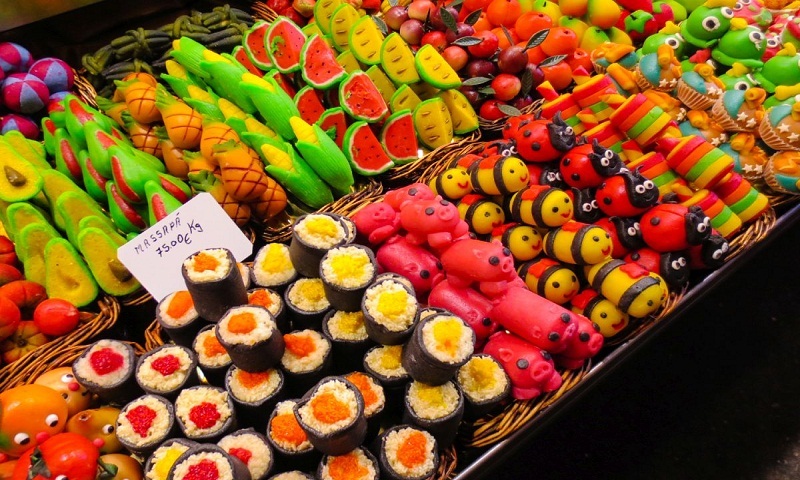 Colouring is responsible for keeping our food’s appearance matching our expectations. Eating is a full sensory experience and colouring makes the food to reflect the taste or freshness we are looking for. Natural is always better than artificial/synthetic. Thus natural colouring has become increasingly popular. Many of the natural and plant-based dyes are the same as what people have used for centuries. Besides good for colouring, they are rich in vitamins and minerals too. But synthetic colours carry potential health risks. So, say goodbye to food colours riddled with chemicals, and check out the healthy food colour options that can be made at home with just natural ingredients – fruits and veggies. These colours contain no artificial ingredients or preservatives. Also, these are cheaper than those store-bought colours. In a high speed blender, blend one cup of purple grapes adding one-fourth cup of water until smooth. Strain and store in an airtight container in the refrigerator. Add a teaspoon to your food or beverage to impart a purple hue. Add more colouring if required. The second option is to work with cabbage. Chop a medium-sized cabbage. Put it in a pan and cover with water. Simmer on low flame for 10 to 15 minutes. It will start leaving a purple liquid. Turn off the flame and let it sit for another 15 minutes. Strain and store in an airtight container and refrigerate. Take one cup of tightly pressed fresh spinach. Boil it in a covered pan for 10 minutes on low flame adding one-fourth cup of water. Turn off the flame and allow it to rest and cool down for 15-20 minutes. After cooling, blend the spinach along with water in a high-speed blender until completely smooth. Strain and store in an airtight container and keep in refrigerator. Take one cup of grated beetroot. Boil it over medium flame in a pot adding one-fourth cup of water. Let it simmer for 15 minutes. Take off the flame. Let it cool. Strain and store in an airtight container and refrigerate it. You can also blend pomegranate seeds or strawberries along with very little water to make natural red colouring. Strain them and store in an airtight container and keep in refrigerator. Pomegranate and strawberries are likely to change the flavour of the dish, so beets are the best option. In a pan take half cup of water. Add one teaspoon of turmeric powder and give a boil on high flame. Then simmer for 10 minutes. Allow to cool. Store in an airtight container and refrigerate. Take one cup of grated beetroot. In a high-speed blender, blend it adding one-fourth cup of water until smooth. Strain and store in an airtight container and keep in refrigerator. Take a cup full of blueberries. Grind them in a high-speed blender along with one-fourth cup of water until smooth. Strain and store in an airtight container and refrigerate. Take one cup of tightly pressed grated orange carrot. Blend it in a high-speed blender along with one-fourth cup of water until smooth. Strain and store in an airtight container and refrigerate. These colours can be used for up to two weeks if stored in an airtight container and kept in refrigerator. They may give your foods less vibrant hues but they are safe to eat. If you want to achieve a brighter colours, make these colourings more concentrated by heating them on low flame for further few more minutes. These colours may introduce some new flavours to your dishes, so add them gradually. Rely on novel things like real fruit and vegetable juices to colour your foods and beverages. If you want to upsurge the flavour and appearance profile of your favourite foods, reach for these natural add-ins. It should maintain its colour when dissolved.